The Flaming Lips have always done things a little differently. Whether that's involved releasing an album on four separate discs intended to be played at the same time, or crowdsurfing inside a massive bubble, Wayne Coyne and co have given it a bash. Famed for their kaleidoscopic live shows, the band's latest piece of crazy gear has been revealed to be a double-neck Epiphone G-1275 customised to include, amongst other things, a Guitar Hero controller. 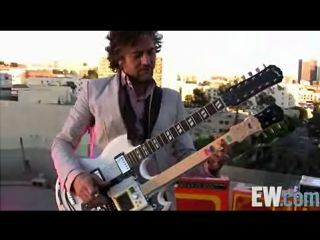 Speaking while filming a jingle for US TV network NBC, Coyne explained: "I've constructed this great looking Guitar Hero double-neck guitar thing here because there's a lot of kids out there that actually think this is how you play guitar now. You just press a series of four or five buttons and it makes every sound the guitar can make." "There's a lot of kids out there that actually think this is how you play guitar now." Coyne's pimped double neck consists of one regular guitar neck, and a neck with a Guitar Hero controller hooked up to a Korg Kaossilator. Check out the video here via EW.com for weird noises galore. In other Guitar Hero news, KFC has teamed up with Activision to launch a Guitar Hero-themed fast food deal packing in a whopping 59 grams of fat and 1210 calories. And that's before you factor a vat of cola into the equation. MusicRadar attempted to contact Buckethead but he was unavailable for comment.